phoenix | Doosan Industrial Vehicle America Corp.
Preach Building Supply is a leading building materials resource, operating three locations in the greater Phoenix, Arizona area. Preach is a five generation family operation that has been servicing contractors, architects and homeowners since 1972. Each of their locations stock a wide variety of building and masonry materials, concrete, landscape rock and stone, pavers, tile, flooring and more. They offer expert advice, fast and courteous service, and prompt delivery to job-sites. Products can be viewed at their design showroom centers located at each of their locations. At Preach Building Supply significant time is spent using lift trucks to transfer heavy materials. The forklifts load and unload everything from bricks and blocks to landscaping products. The prior forklift brands had several maintenance issues, which took a toll on their productivity. The company decided to replace their outdated forklifts. After meeting with Mark Prine, salesman at Reliable Forklift Sales of Phoenix, Preach chose Doosan forklifts. “We’ve been very impressed with Reliable Forklift Sales. Whenever we ever need service Reliable takes care of it immediately and will bring us a loaner forklift to keep us running. Based on my 30 years of building supply experience using forklifts, I would definitely recommend buying a Doosan from Reliable,” comments Robbie Mendez. This entry was posted in testimonials and tagged #doosan, 2015, building, dealers, dealership, DIVAC, durable, forklift, forklifts, machines, material handling, news, phoenix, preach, Preach Building Supply, productivity, reliable, service, supply, testimonial on August 7, 2015 by doosanlift. ReCommunity Recycling is an industry leader, working with communities in 14 states to recycle resources destined for landfills. They convert recyclables into clean and efficient commodities, products and energy. Their goal is to preserve the environment, benefit the economy and promote recycling value awareness. ReCommunity Recycling’s River Plant in Scottsdale, AZ recycles plastics, paper and glass. One of five Arizona locations, the River Plant processes 29 tons per hour and over 560 tons a day. Operating ReCommunity Recycling’s River Plant requires durable and dependable equipment built to function continuously for 18 hours a day. Loose wires and broken glass are always present, making for a tough work environment. The other brands of forklifts they previously used would break down from lots of debris getting into their engine compartments and from bailing wires getting wrapped around the forklift tires. Those lift trucks also overheated, due to the small size of their radiators. 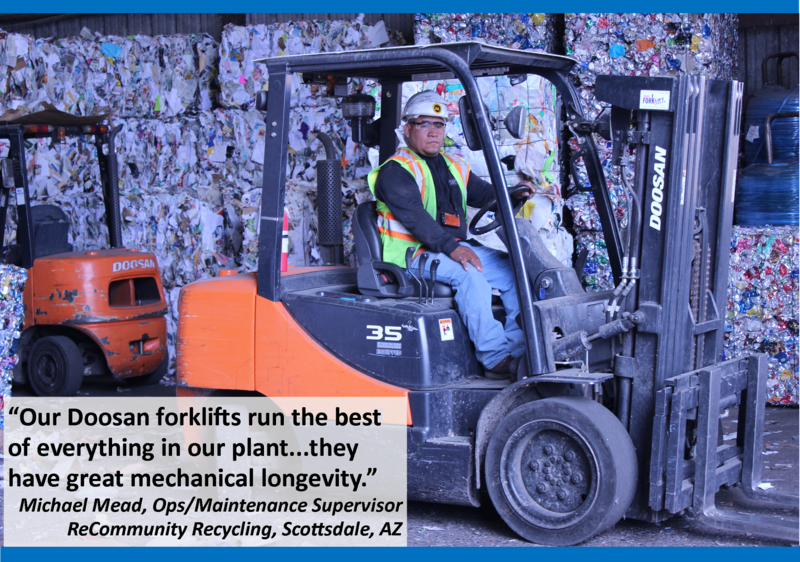 ReCommunity Recycling needed new and better forklifts to keep their production on schedule, so they turned to Reliable Forklift Sales, an exclusive Doosan dealer in Phoenix, AZ. Customer service is #1 at Reliable Forklift Sales. “If I need service, Reliable is here at my plant within an hour. Reliable understands how important it is for us to keep our forklifts moving and they always take care of us, bringing us a replacement forklift if necessary. 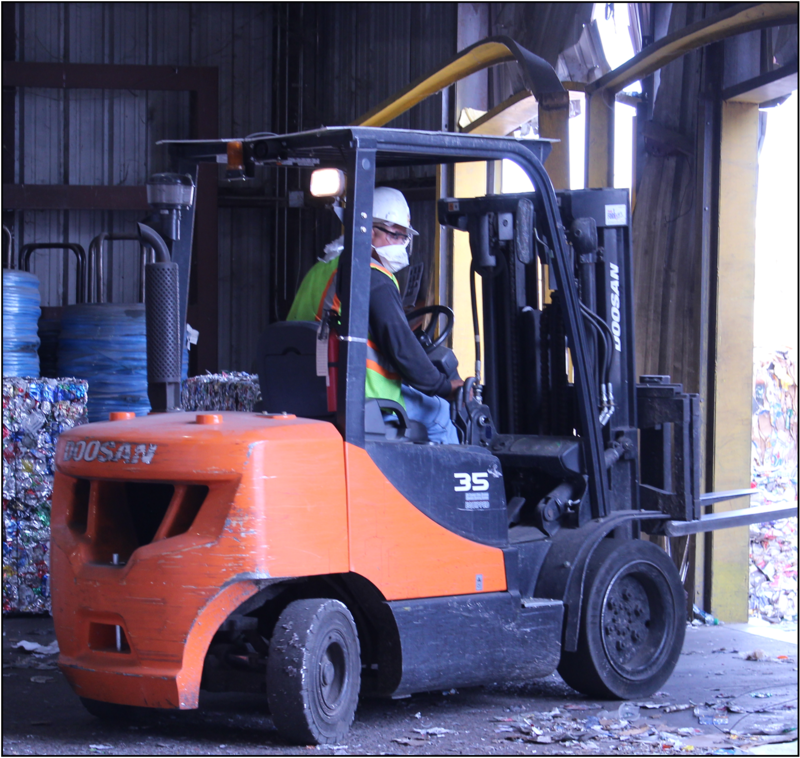 I would recommend Reliable Forklift Sales and Doosan forklifts,” notes Michael Mead, Ops/Maintenance Supervisor, ReCommunity Recycling. This entry was posted in testimonials and tagged #doosan, az, dealers, dealership, forklift, forklifts, june, machines, material handling, phoenix, productivity, recycling, reliable, river plant, service, testimonial, warehouse on June 22, 2015 by doosanlift.